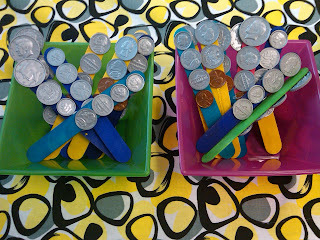 Elementary Shenanigans: Count 'Em Up...Money Sticks!!! First, let me begin my expressing my excitement about having the opportunity to be one of the authors for Me and My Gang! This is going to be such a fabulous community of learners and I cannot wait to learn and grow from your inspiration! If you have not joined this community, head on over and become a follower! So, for my first post, I just had to share one of the best ideas (pinterest inspired) that I have seen in quite some time. When I say the words "play money" what is the first thing that comes to your mind? Well, if you are a teacher, you are probably thinking about hearing it drop and roll all over the floor. Or perhaps you are thinking about the fact that each year, your stash of money dwindles away and you are always left wondering where ALL of those coins went. Or maybe you are even one of "those" teachers who has tried to pay for a quick soda and realized that you handed the cashier play money that you confiscated from a student during instruction! If you have any of those thoughts...follow me here...and wait until you see this idea!!! 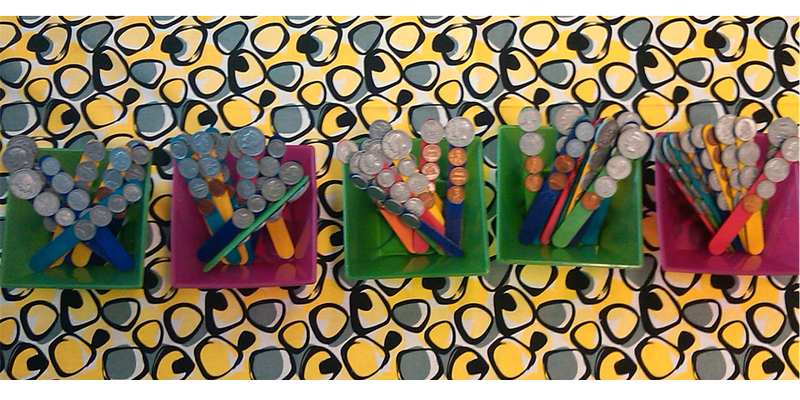 I created baskets with 10 sticks each for easy center use or small group instruction. 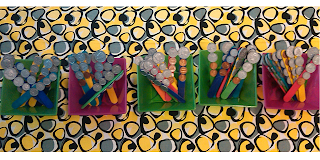 I then labeled the sticks in each basket 1-10 (I am in the process of creating a recording sheet for a little center activity. I will post this little addition ASAP. To keep the sticks from getting all mixed up, I labeled each basket with a number. I had five baskets, so I labeled them 1-5. I then labeled each stick in the basket with the correlating number on the back. 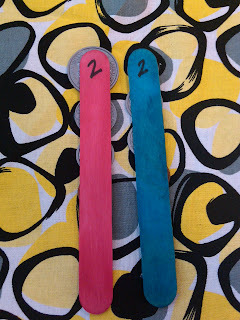 For example, all of the sticks in basket 2 are marked with a 2 on the back. 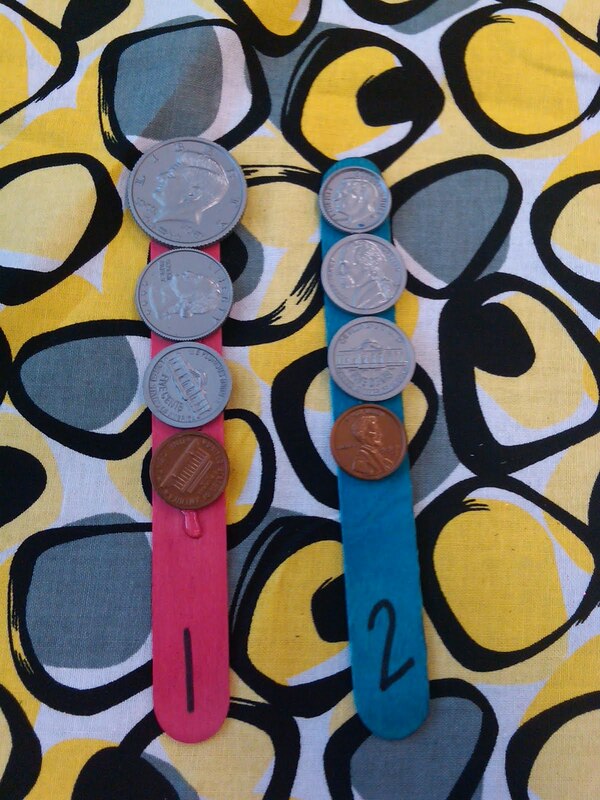 So, just in case they get misplaced, the students know exactly where to put the money stick. There you have it! I hope that this little idea that I picked up will help you as much as I KNOW it will help me this year! Now, head on over to check out Me and My Gang! Wow nice! 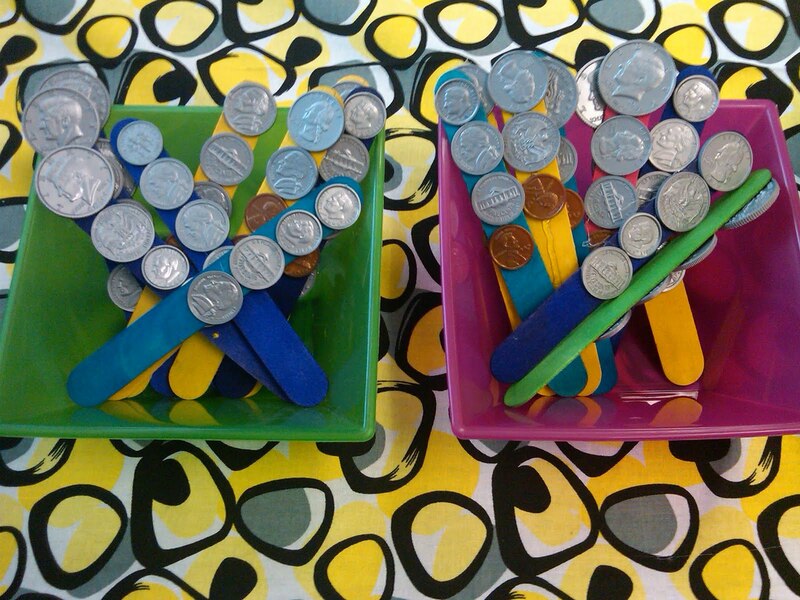 Then are you planning on having the kids count the $ on each stick for practice? I've been trying to figure out how I was going to teach money. I was thinking of using real money for authenticity, but I was scared it would disappear. That 'play' money looks great. What kind of glue did you use for the money? hot glue gun works great, just be sure to press the coins down into the glue so it covers the whole surface for best adhesion. 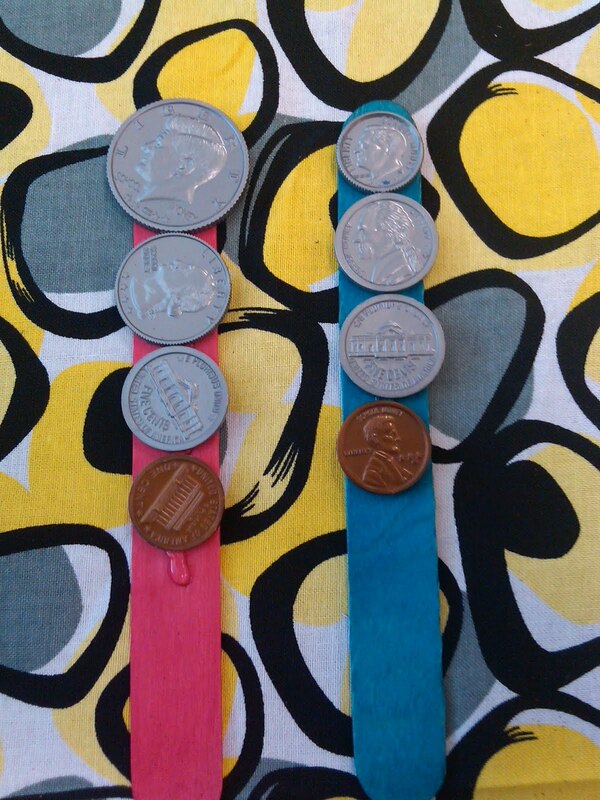 If you want to spend the money, Glue Dots would work well, too. I love this for a quick and easy center! I just linked to this on my blog as part of my "Pins of the Week" post. Thanks for your great ideas!